It's time for another Pinterest Tested post. Not only has it been a while, but my dishwasher is really, really gross so I might as well turn that nightmare into a useful post for my favorite people (that's you, my readers!). Here is the link to my original pin: How to Clean Your Dishwasher. One of my favorite boards is my Tips and Tricks one, where you can find this pin. I keep track of many household, cleaning, and cooking tips to be tested for later use. Of course, there is no way I will ever have enough time to try out all of the hints, but I keep trying! I didn't use all of these items, but they are the recommended ones depending on what type of cleaning your dishwasher needs. 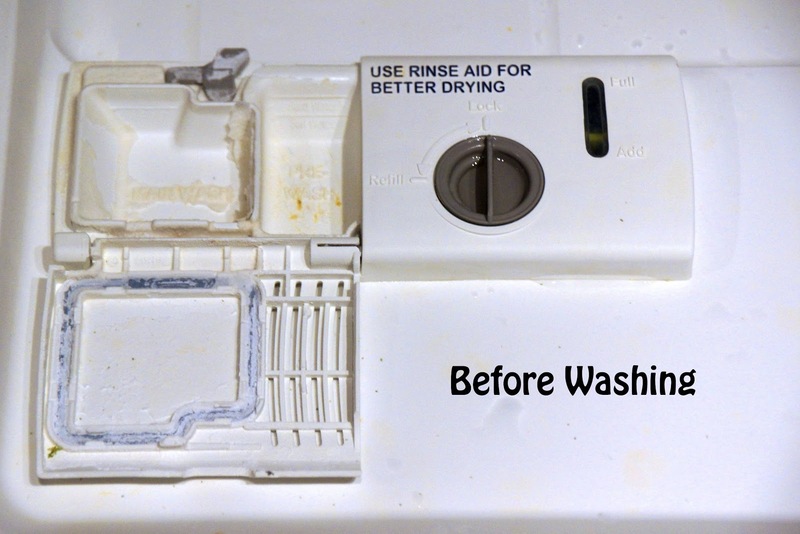 My dishwasher's biggest problems are hard water stains and detergent deposits. First off, your dishwasher should be empty. I know that seems a bit obvious; however, stranger things have been known to happen. 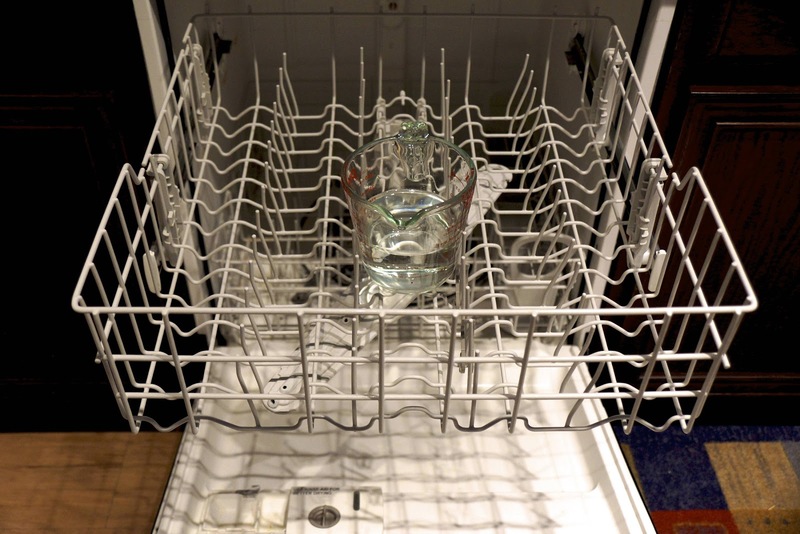 Cleaning the outside of the dishwasher is simple. 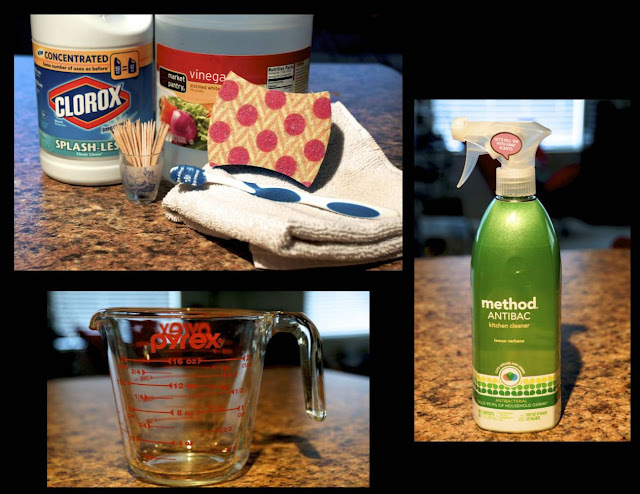 A basic kitchen or all-purpose cleaner can be used to wipe it down. Generally, I wipe mine off whenever I scrub the counters, so the outside of mine was easy. As you can see, it's yucky. Seriously yucky. 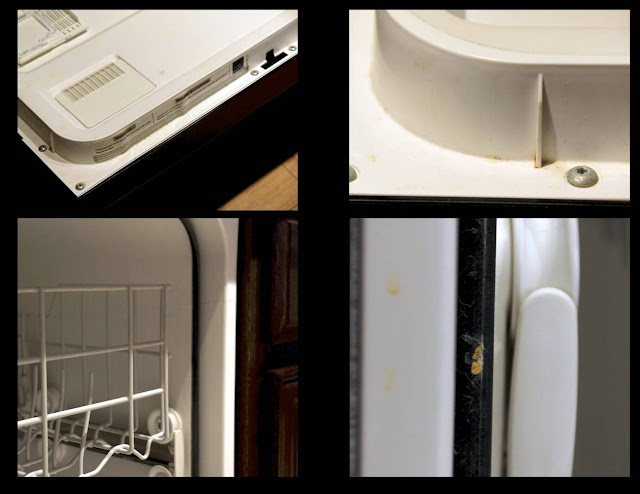 Over time, funk and gunk builds up on various parts of your dishwasher, and then you wind up with that disaster above. YUCK-Y. The first step (according to my pin) was to clean any debris from the propeller arms and the drain. I didn't actually need to do this step, yay! No large chunks of gunk for me. If you need to do this, the site recommends using a toothpick. Next step is to clean the rubber seal and area around the door. Yeah, I definitely needed this step. The evidence is in the picture below. The seal, and the area just outside of it, are not touched by any water/cleaner when the cycle runs (sort of the whole point of the seal, right?). 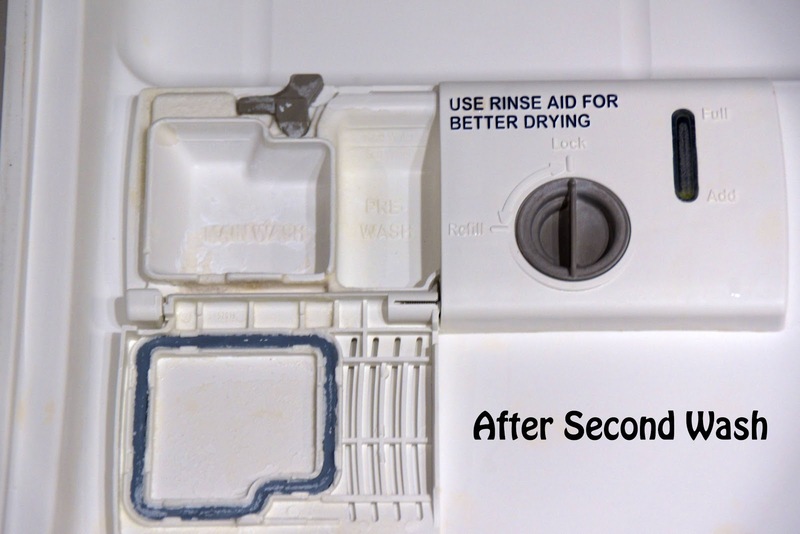 I used a mixture of 1 part white vinegar to 3 parts water to clean this area with a sponge. All the goop came off easily, no real scrubbing involved. The pin also recommends using a toothbrush for the harder to reach areas, but I didn't find this necessary. This area cleaned easily, and only took a few minutes to accomplish. Next step: All the rest of the gunk. This sounded way too good to be true! While there has been some noticeable improvement, I think I'm marking this test in the FAIL category. Who knows how many cycles it would take to clean off everything? The other areas of grime (rust staining, and the hard water stains around the propeller) were slightly improved, but also did not come entirely clean. 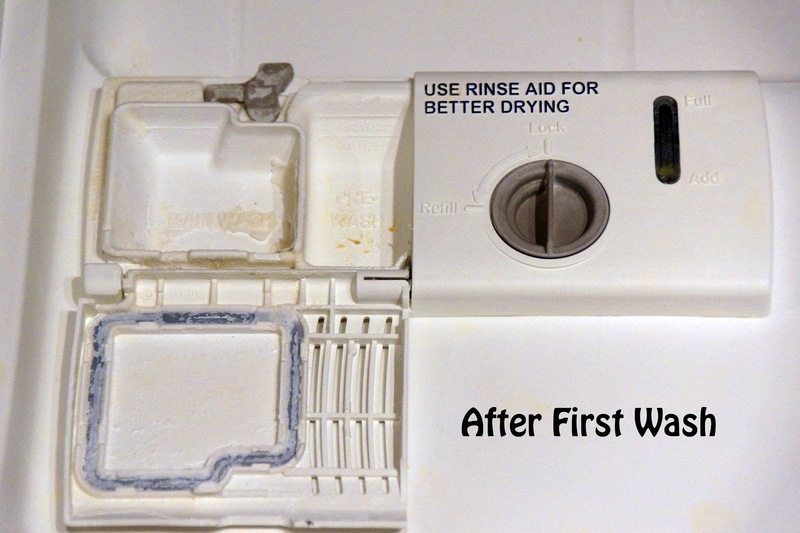 Granted, my dishwasher was pretty gross to begin with. And perhaps this method would work better as regular maintenance, instead of a desperate call for help. I think I'll add this to my regular cleaning cycle (perhaps once a month). If there is improvement, I will definitely update you! 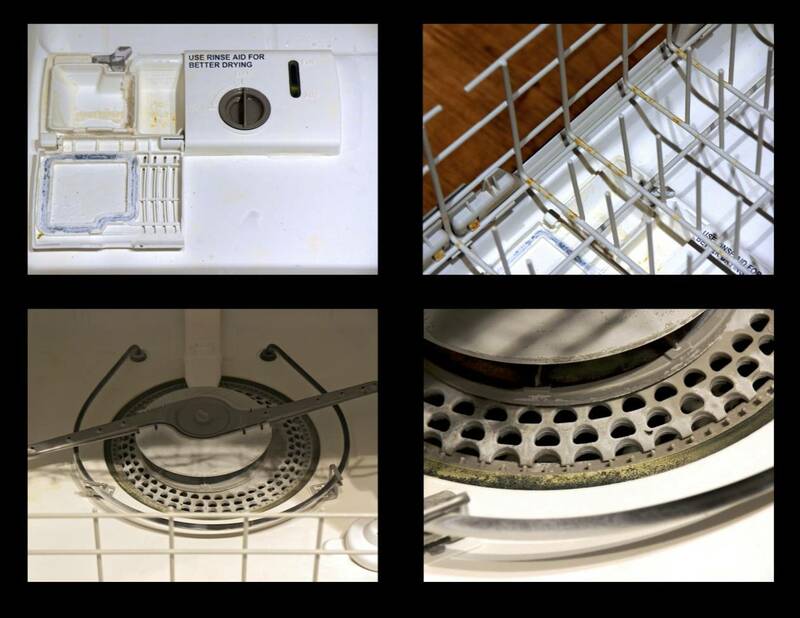 Have any of you used this method to clean your dishwasher? Did it work, or fail? If you know a better way, consider testing it and telling us all about it... 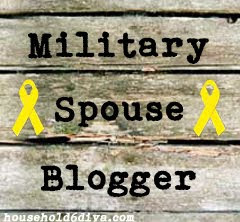 I'd love to see you as a guest blogger here!